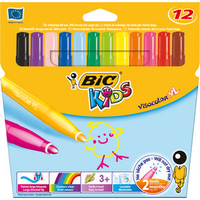 Easy to hold and ideal for children aged 3 and over. Can be left uncapped for at least 2 months (excludes black). Water based ink is washable on most fabrics. Nib has excellent resistance to being pushed in. Nib size 4.5mm. Ventilated cap. Approx Dimensions (CM): D19.1 W18.5 H1.3. Approx Weight (KG):0.158.